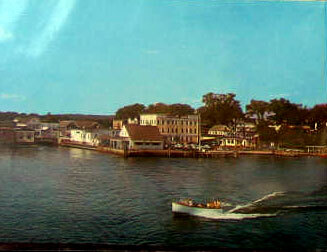 Below, a photo from the 1880s was colorized to produce a circa 1910's postcard. 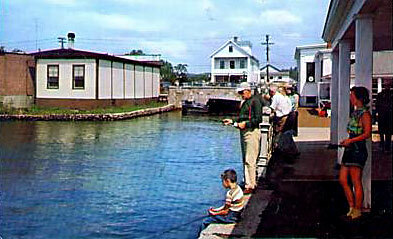 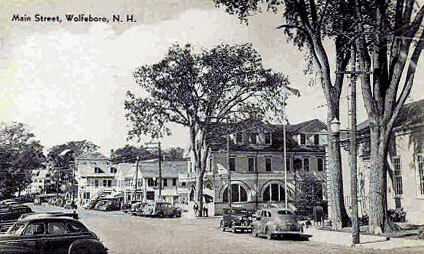 Notice the first two buildings on the left, which match the buildings in the 1950's photo above. 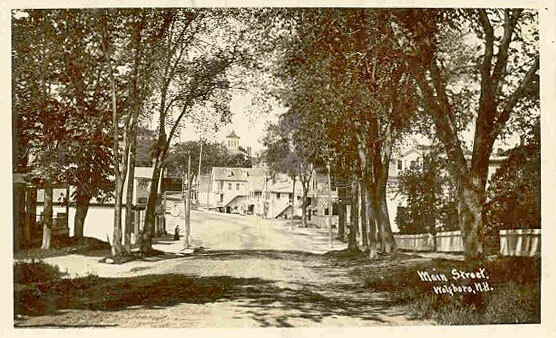 The caption on the card below is partly correct. 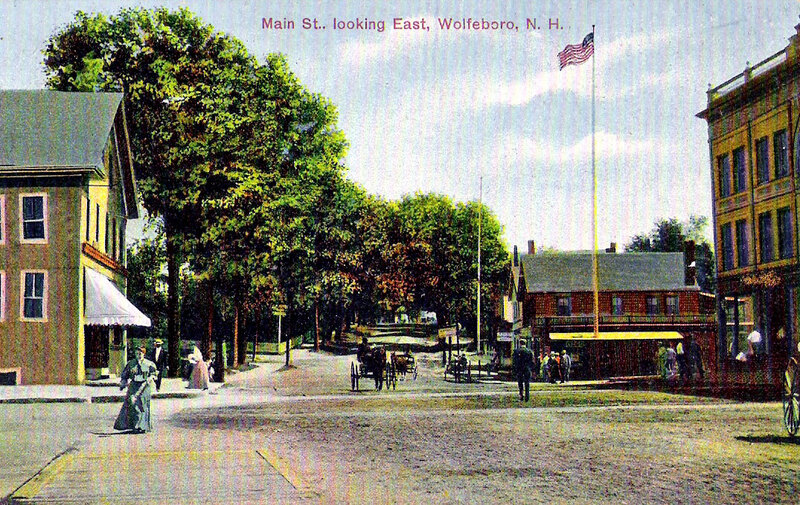 We are looking Southeast. 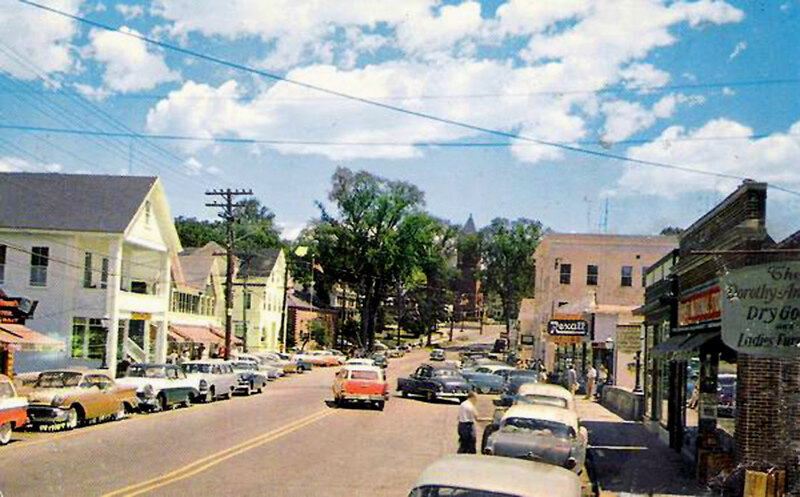 Below, a colorized version of the above photo. 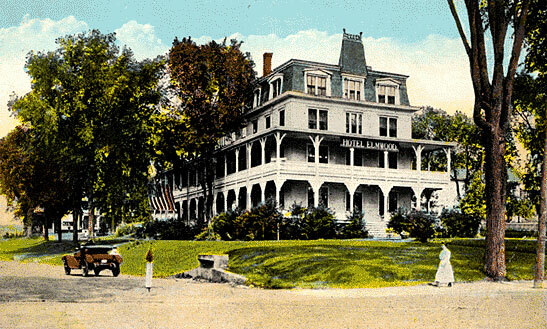 Below, the original black and white version of the above colorized photo. 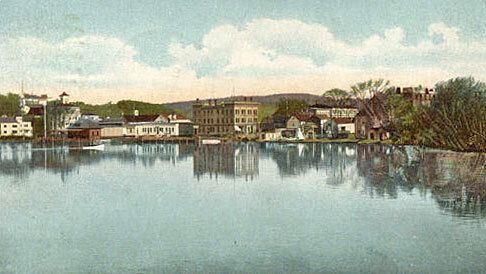 The same view, at different times, is labelled differently, either looking south, above, or looking east, below. 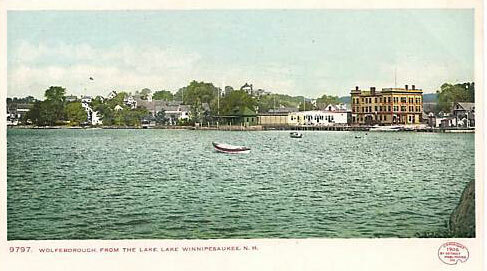 Both are correct, as the view is to the southeast. 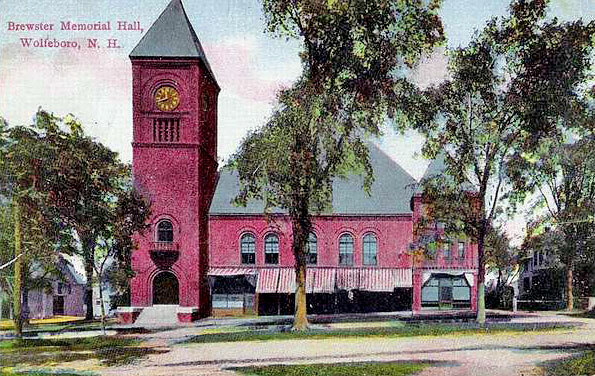 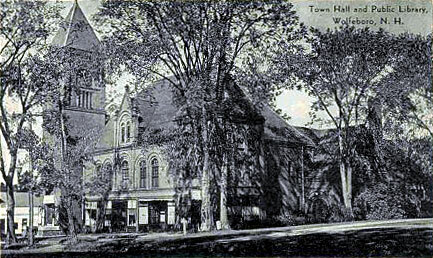 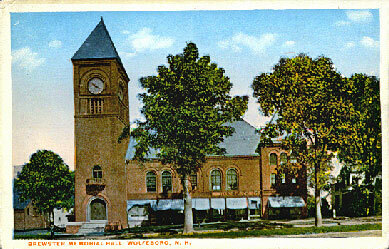 Built in 1890, Brewster Memorial Hall, also known as the Wolfeboro Town Hall, is seen at the top of many of these views looking South. 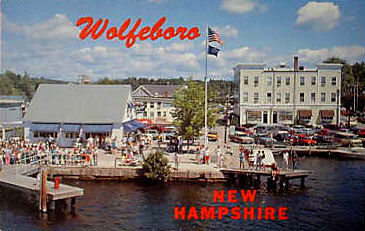 The building is still the home of Wolfeboro's municipal offices. 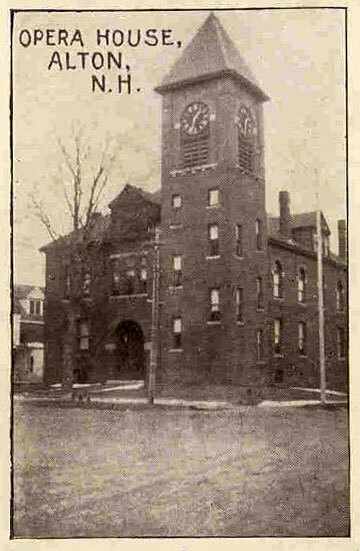 The clock tower still functions and features a bell made by Paul Revere which rings out every hour. 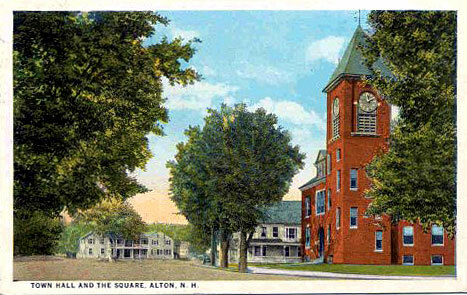 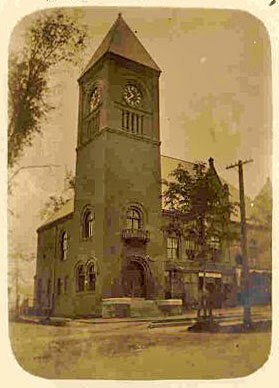 Wolfeboro's nearest neighbor, Alton, had a nearly identical clock tower. 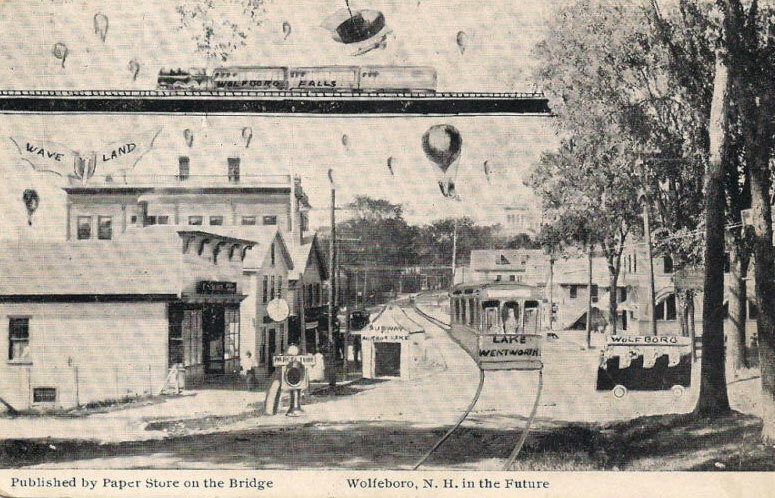 From 1911, a whimsical view of Wolfeboro in the future shows an overhead rail line, street trolley, subway entrance, a minibus, a flying contraption with bat wings, hot air balloons, etc. 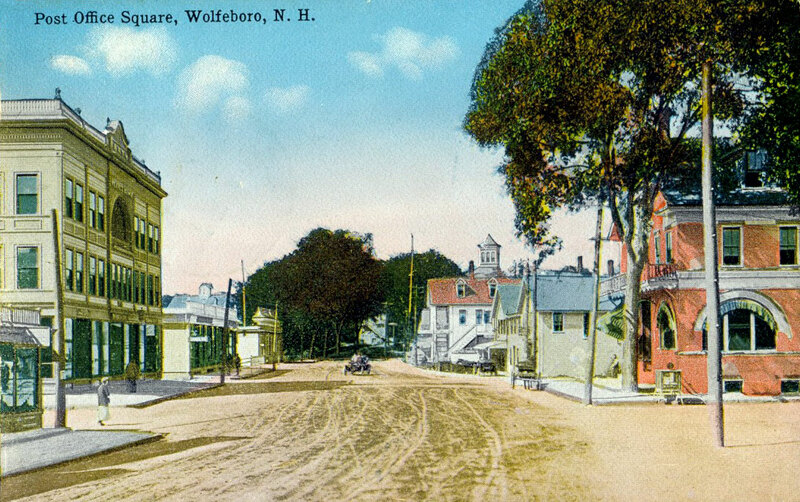 - but no cars! 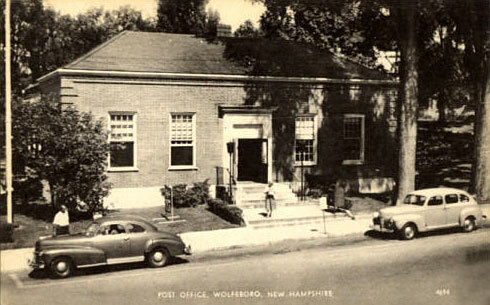 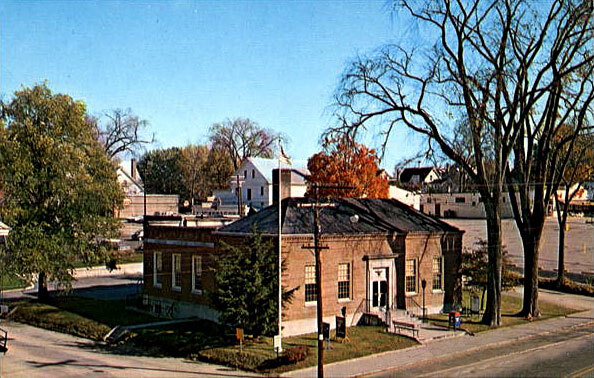 Below, the Wolfeboro Post Office, built in 1933, seen on the right in two of the above photos. 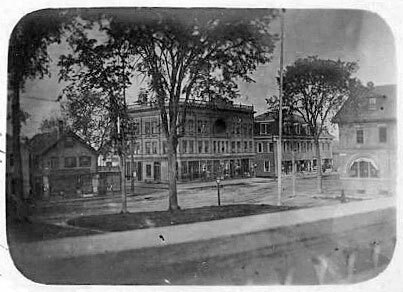 Notice the building on the right of the above three photos. 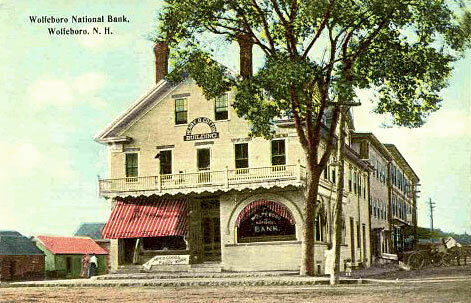 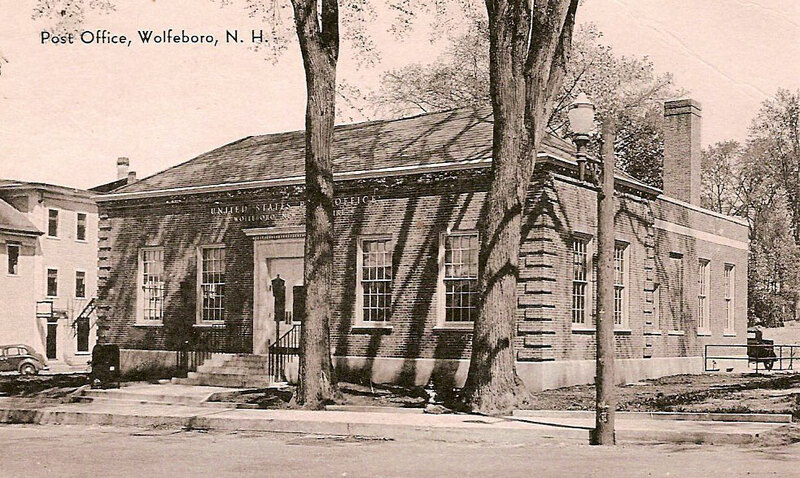 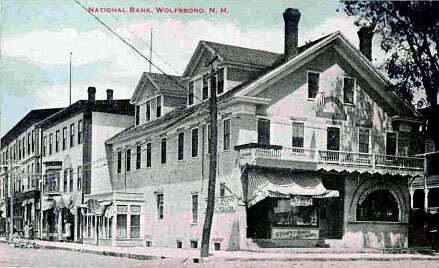 This was the Wolfeboro National Bank building, below. 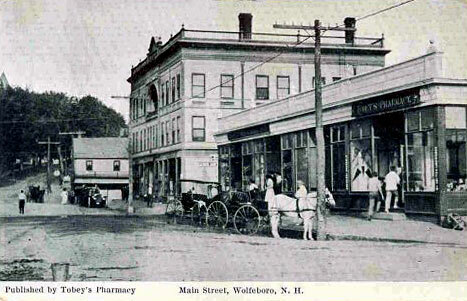 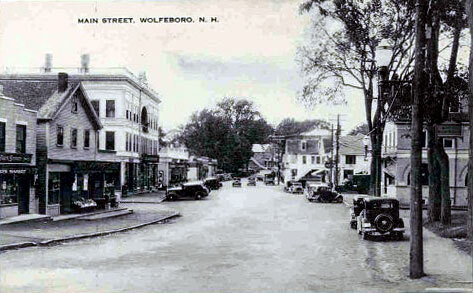 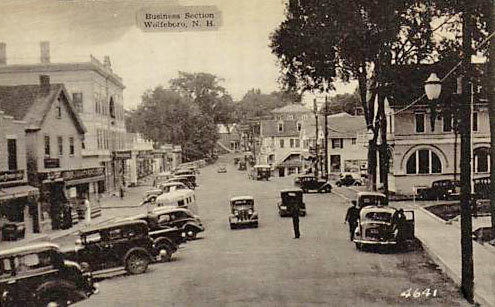 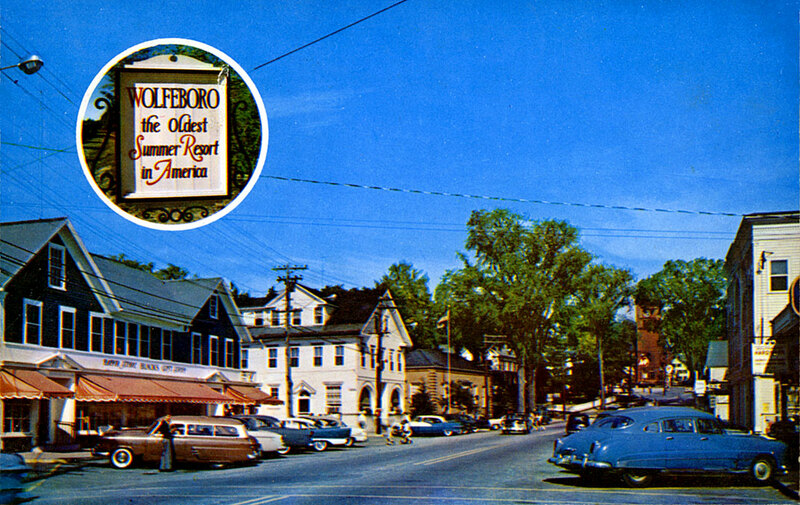 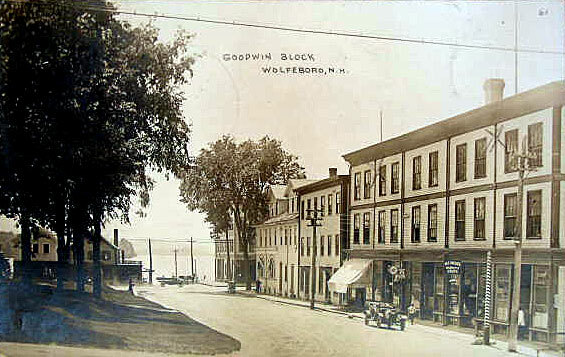 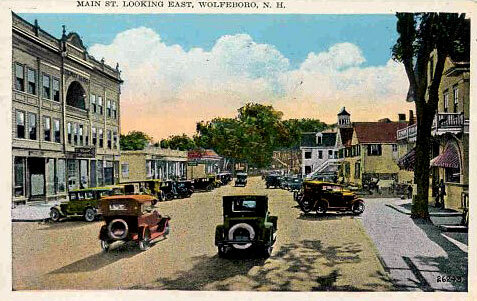 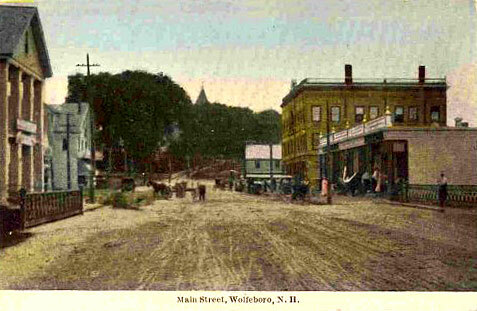 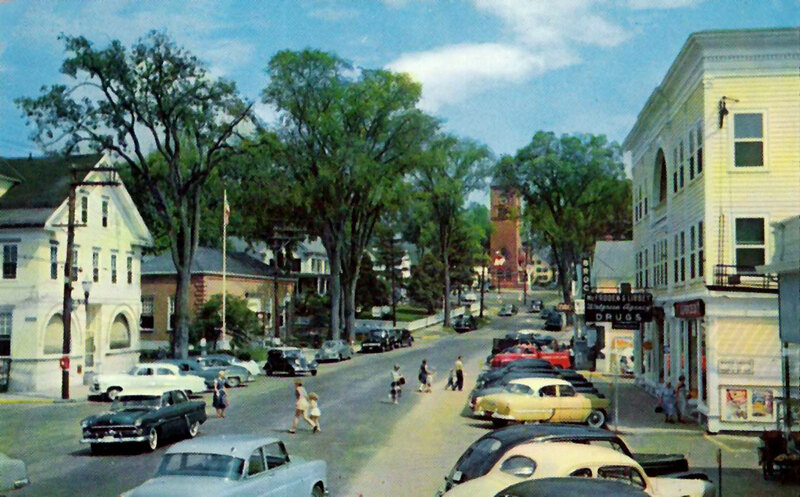 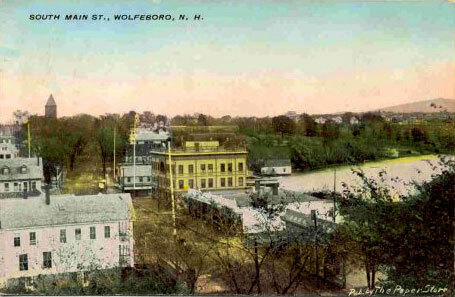 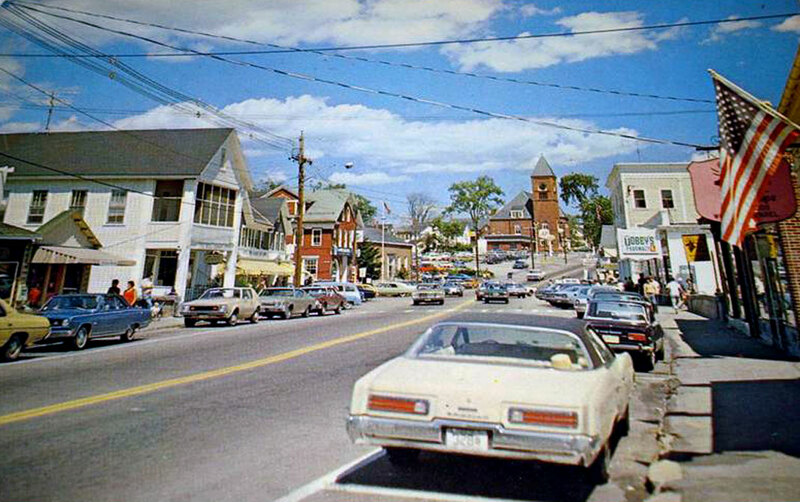 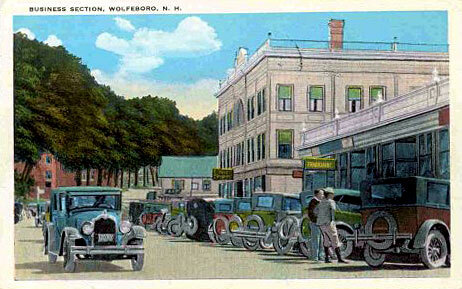 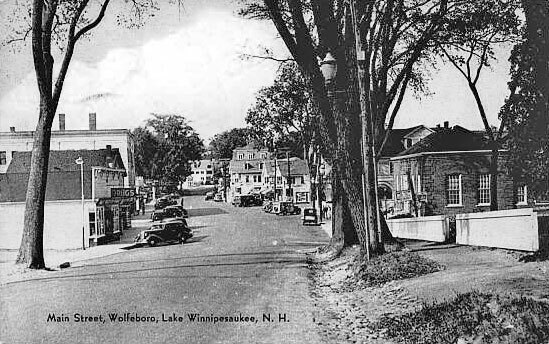 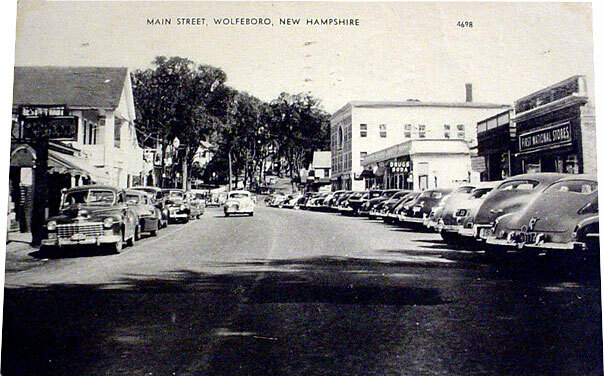 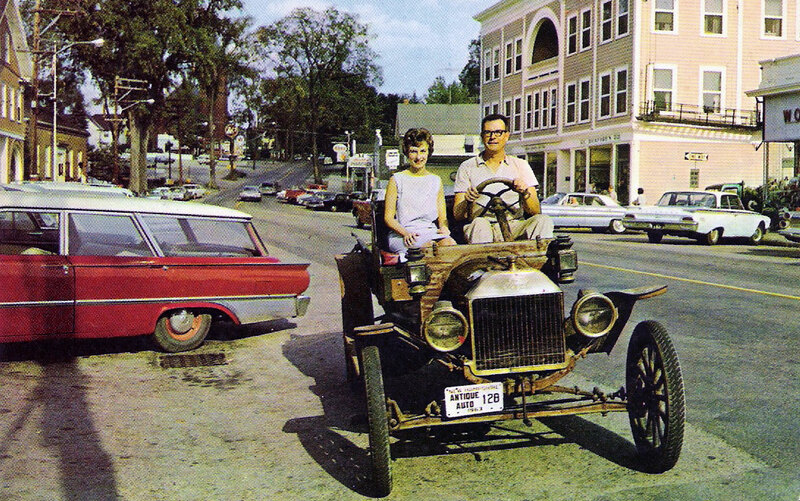 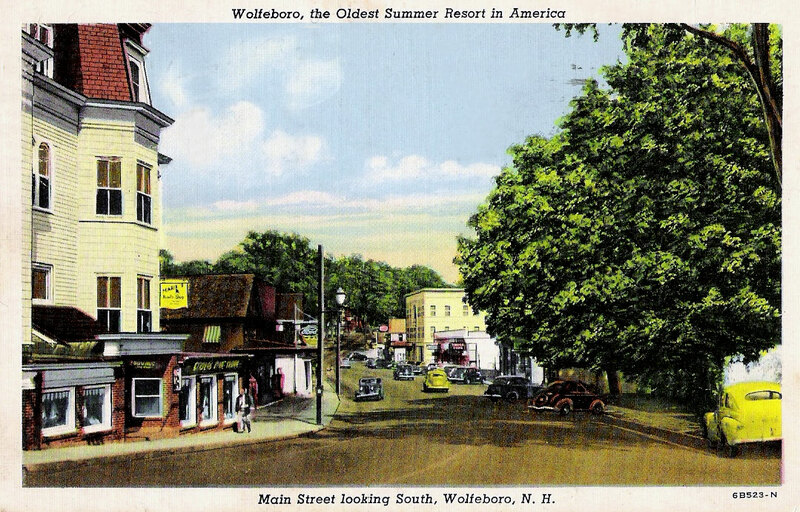 Notice in the above photo the street to the right of the Wolfeboro bank building. 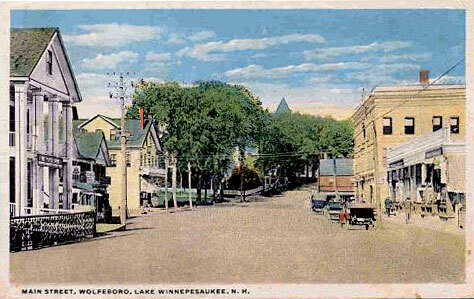 Here is the same street, looking toward the waterfront. 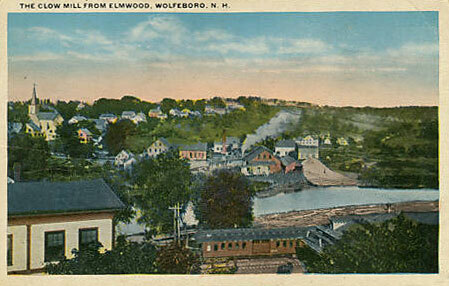 The caption on the card below is wrong. 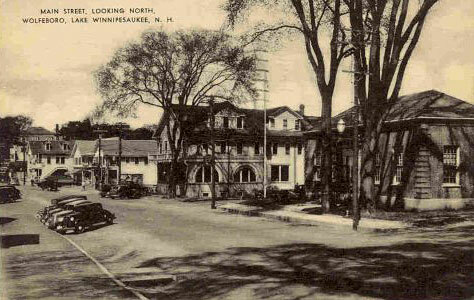 We are looking Northwest, definitely not East! 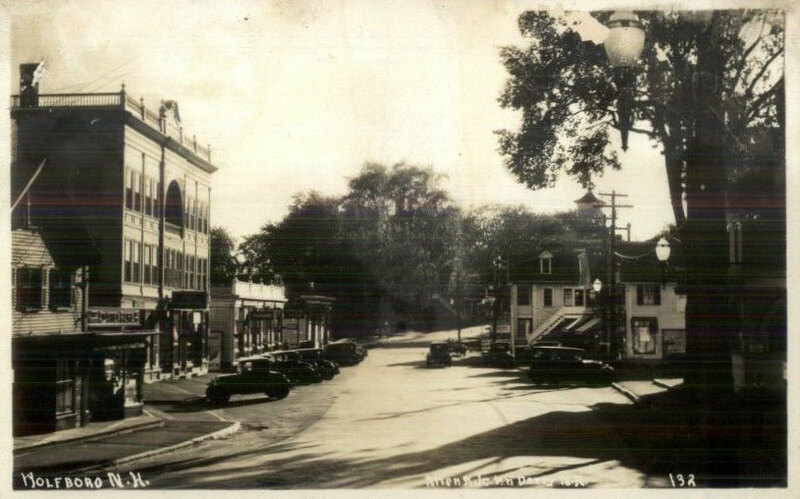 Below, a view from much further up Main Street; note the Brewster Memorial Hall on the right. 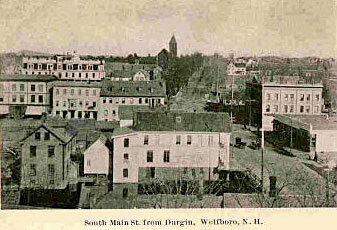 Most of the other photos looking North were taken from a vantage point just below the hall. 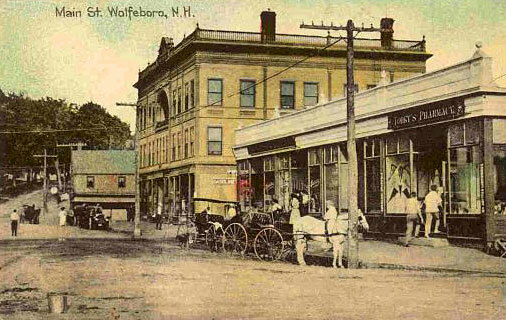 Another view of the antique auto seen in the photo of Black's on the upper right, here looking South on Main Street. 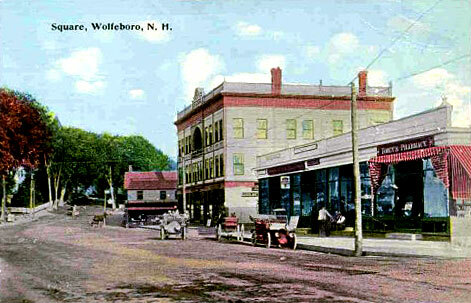 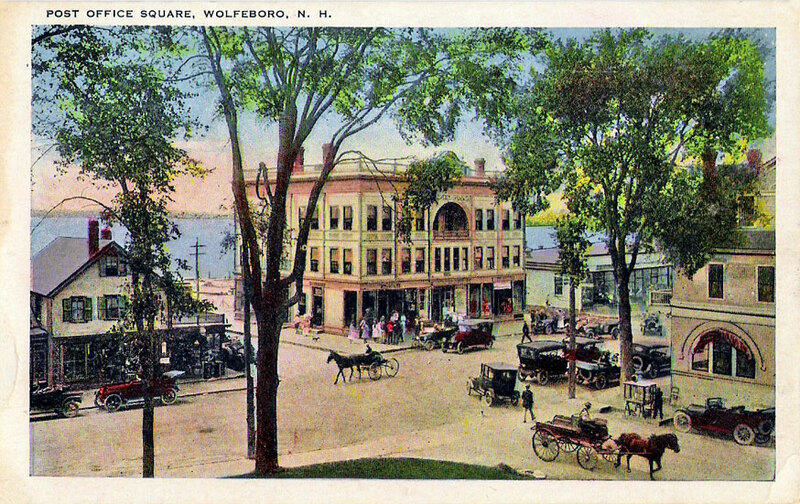 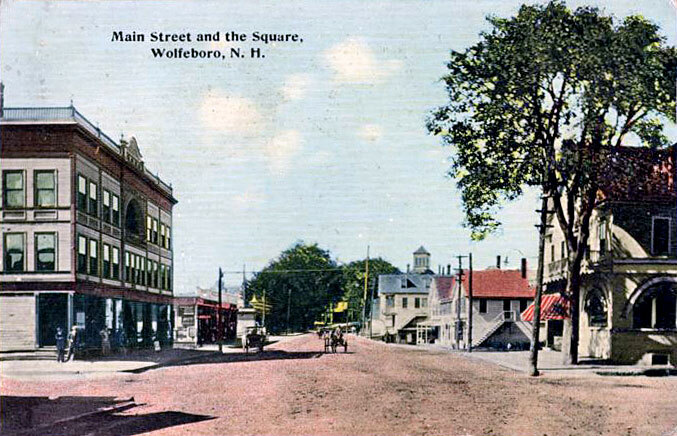 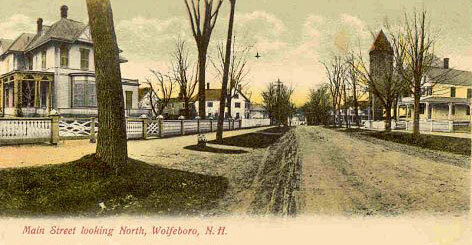 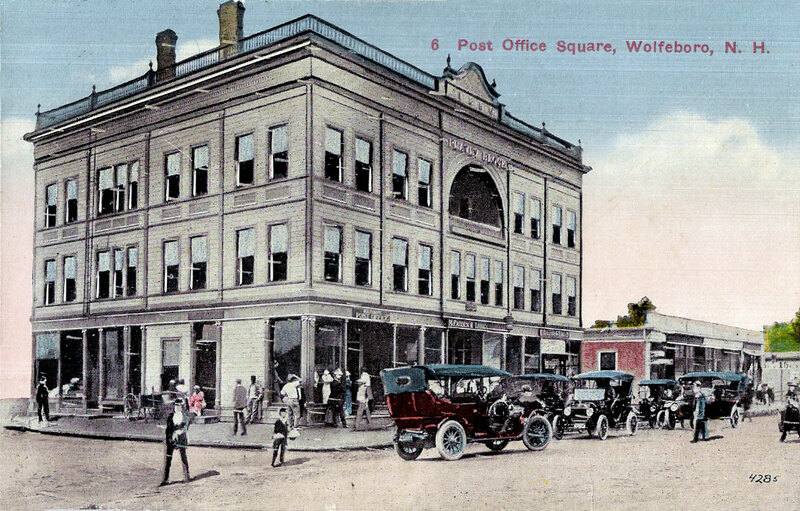 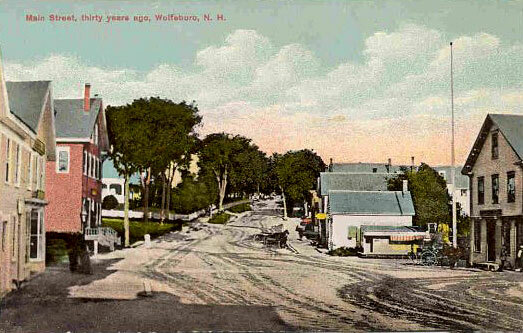 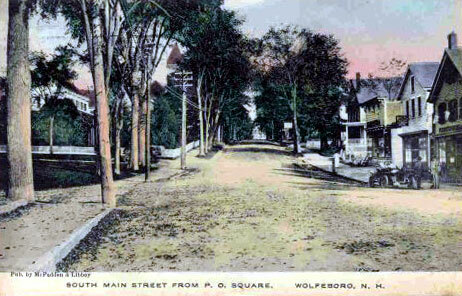 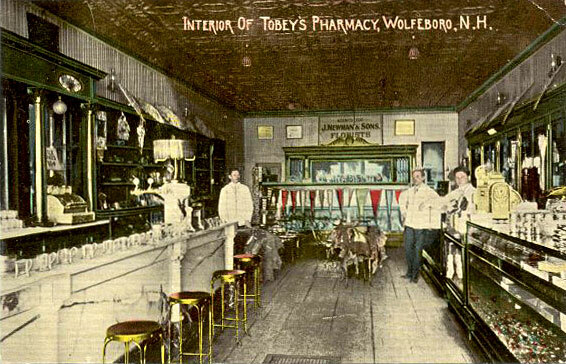 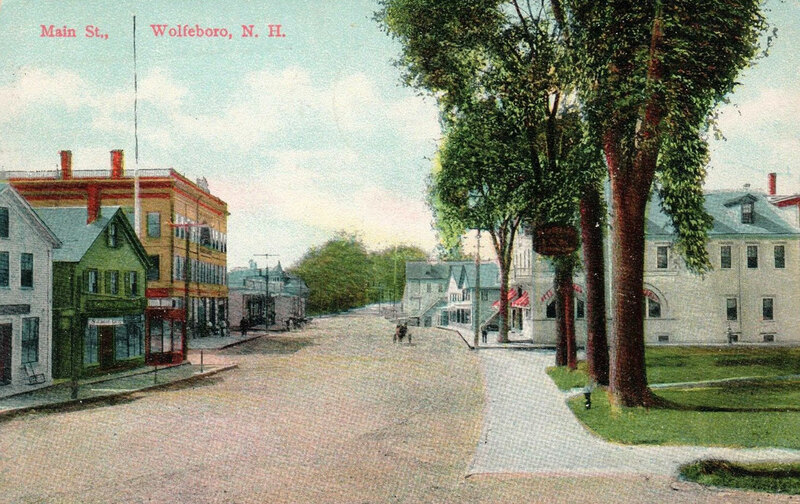 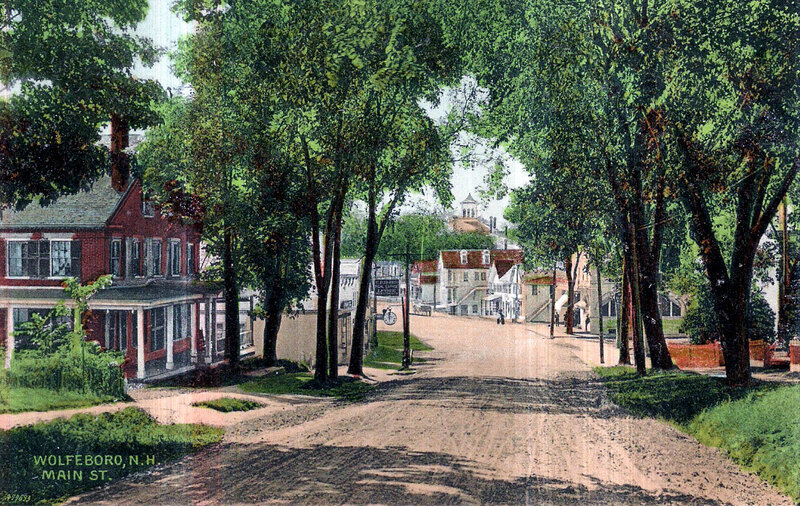 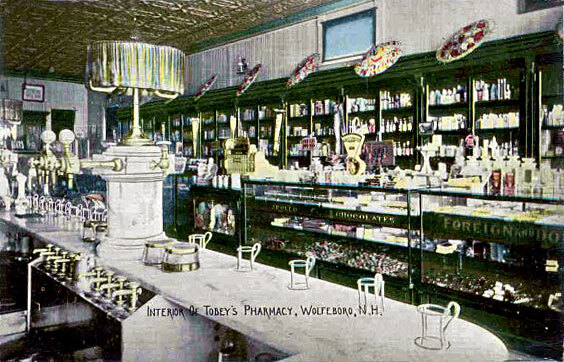 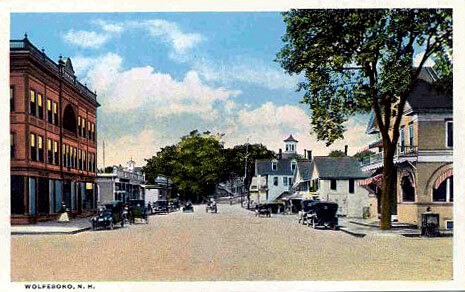 Wolfeboro's Post Office Square, circa 1905 to circa 1925. 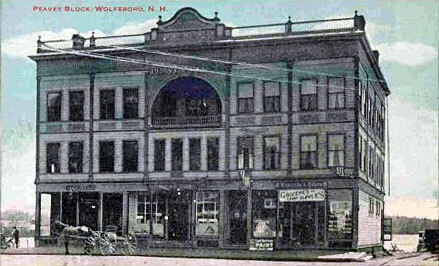 The large, 3 story building at the center was known as the "Peavey Block". 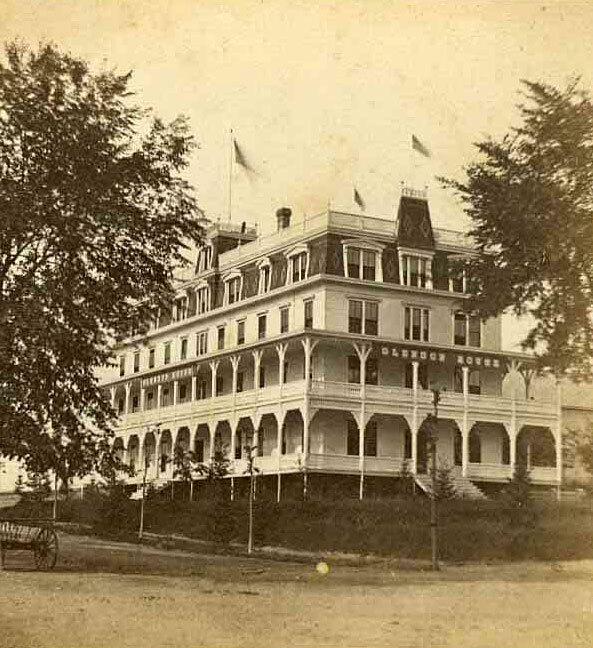 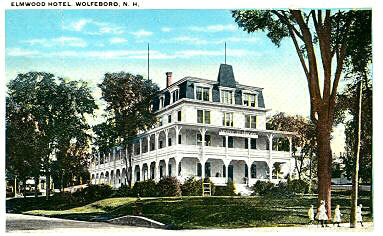 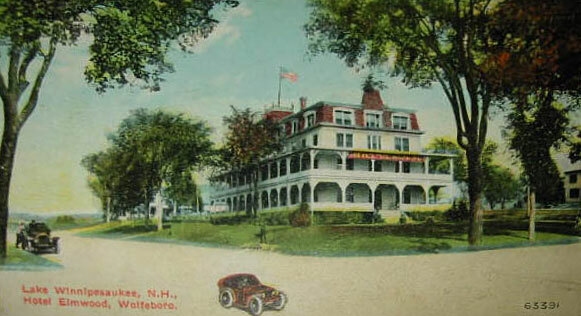 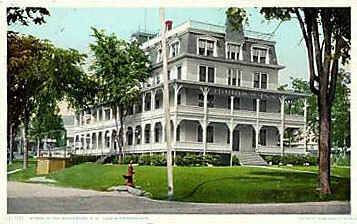 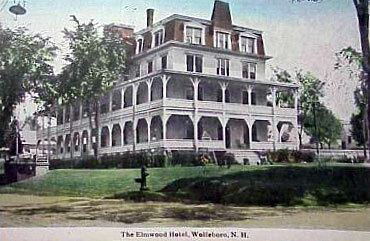 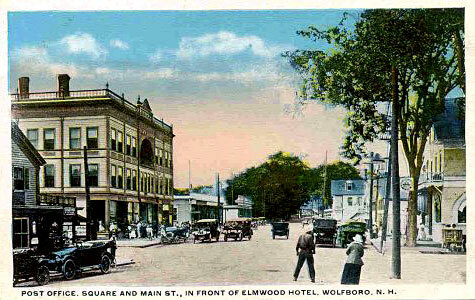 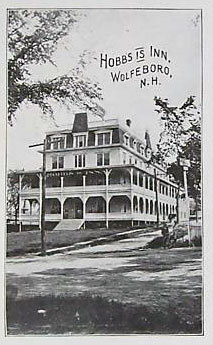 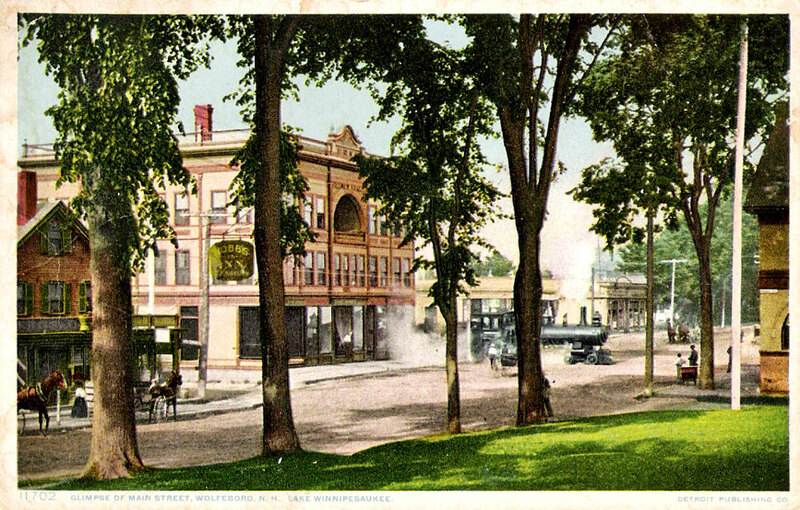 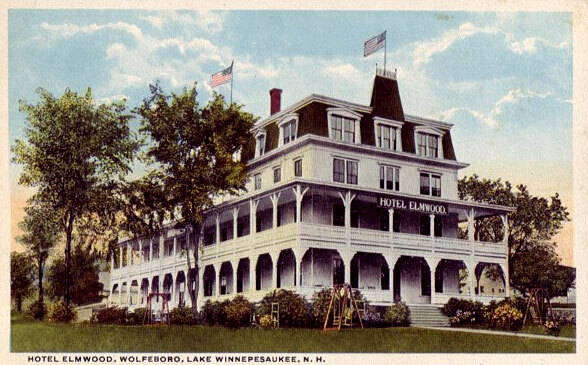 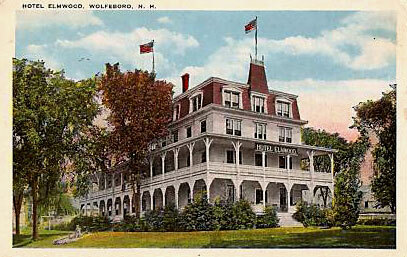 The Hotel Elmwood (1872 - 1933), mentioned in the caption in the above postcard, stood where the Wolfeboro Post Office is today. 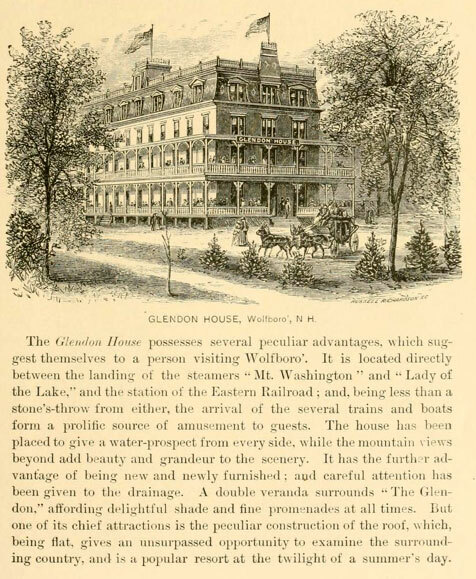 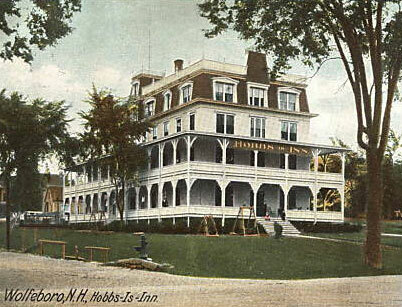 In its earlier incarnation it was known as the Hobbs-Is-Inn; and before that, as the Glendon House. 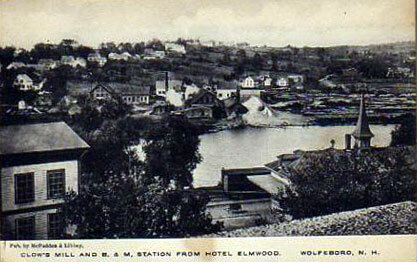 Two views of Clow's Mill from the Hotel Elmwood. 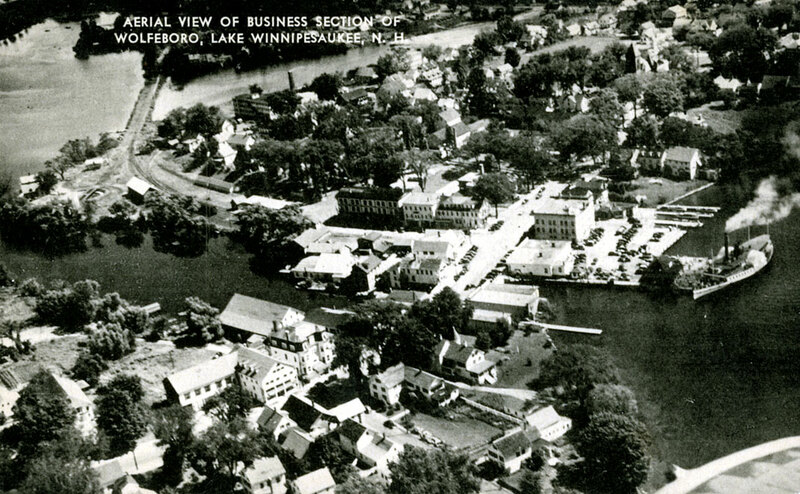 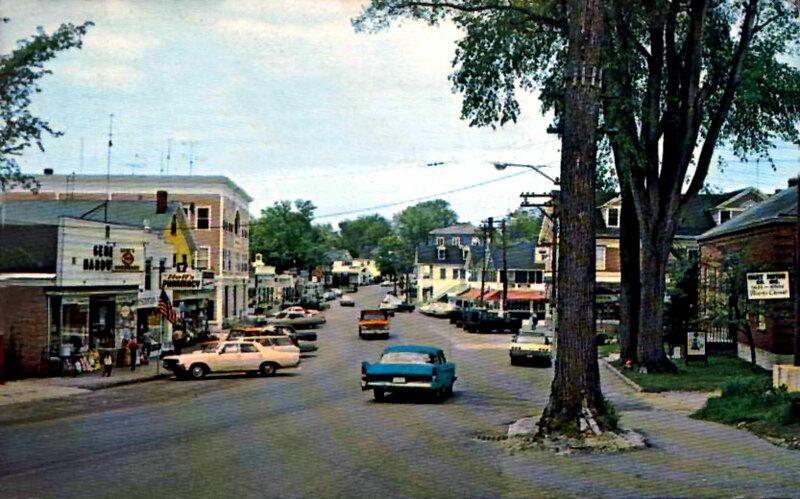 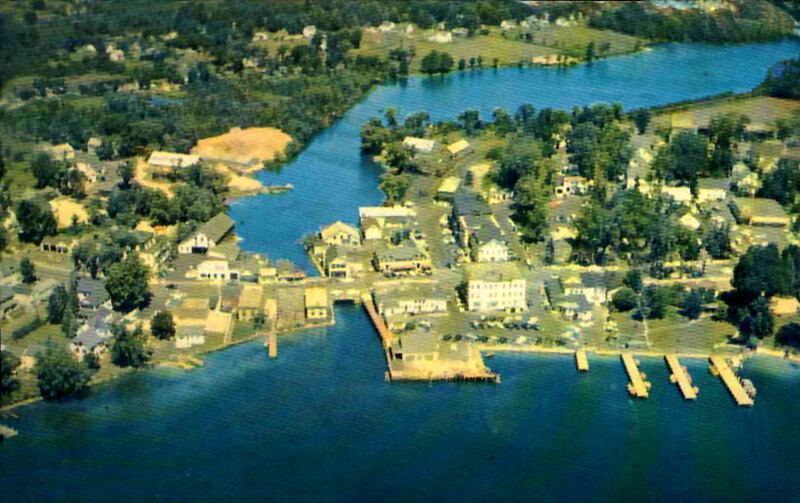 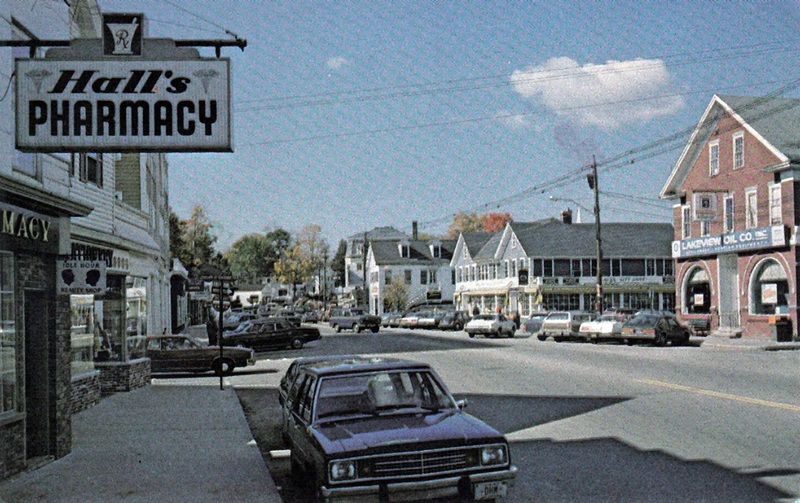 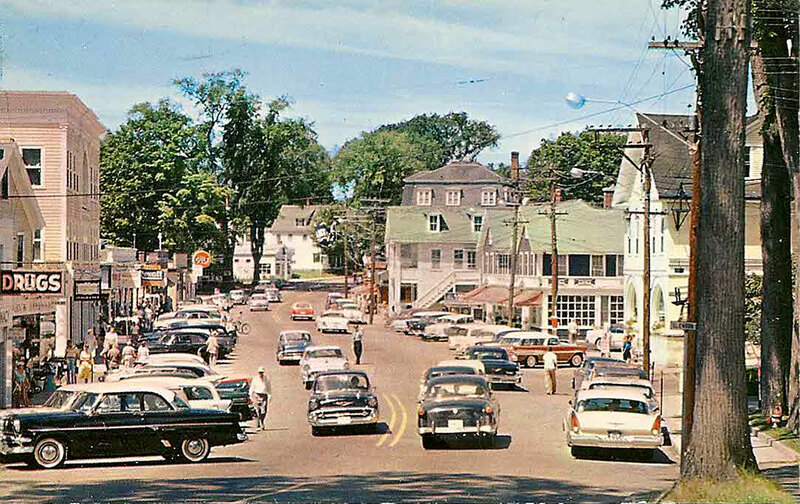 Below: This 1960's close-up aerial of Main Street shows the four principal buildings at the center of town, seen throughout the above photos: the Peavey Block, Tobey's pharmacy, Black's gift shop, and the Wolfeboro National bank. 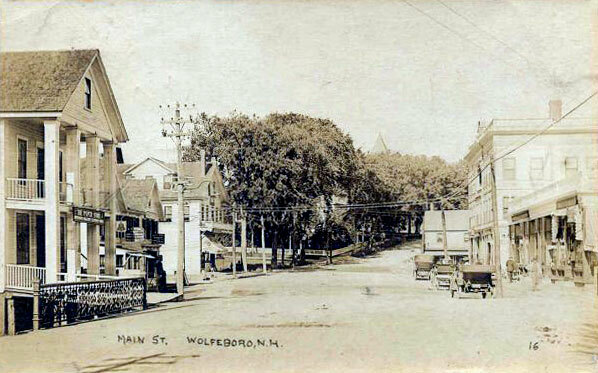 Here one can also still see the tracks of the former Wolfeboro Railroad entering town along the East side of Back Bay and ending at Wolfeboro Station. 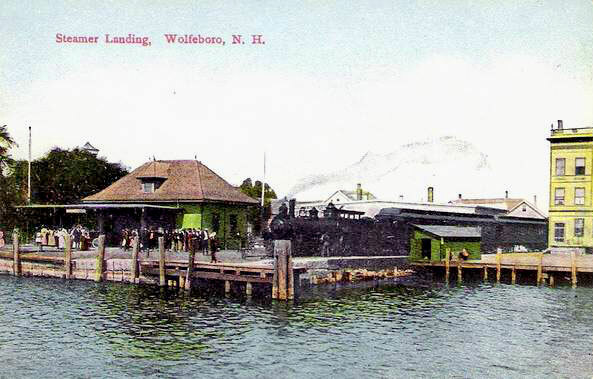 Beginning with their extension in 1880 until their removal in the late 1930's, the railroad tracks had continued past the Wolfeboro Station, passing between the four buildings mentioned while crossing Main Street, and then reaching the Lake Station at the wharf, where one could board the old Mount Washington steamer. 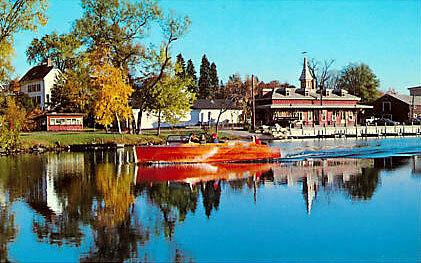 The Lake Station, seen on several postcards below, was built in 1900. 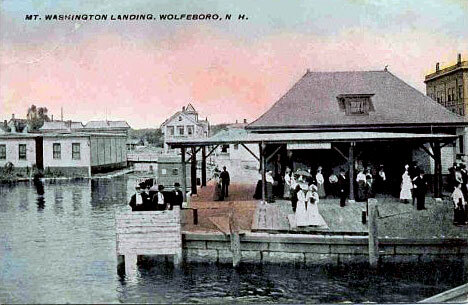 On May 28, 1899, a storage building on the wharf, which had previously served as a waiting room for both the Lady of the Lake and Mount Washington steamers, burned, in what was one of the most devastating fires in Wolfeboro history. 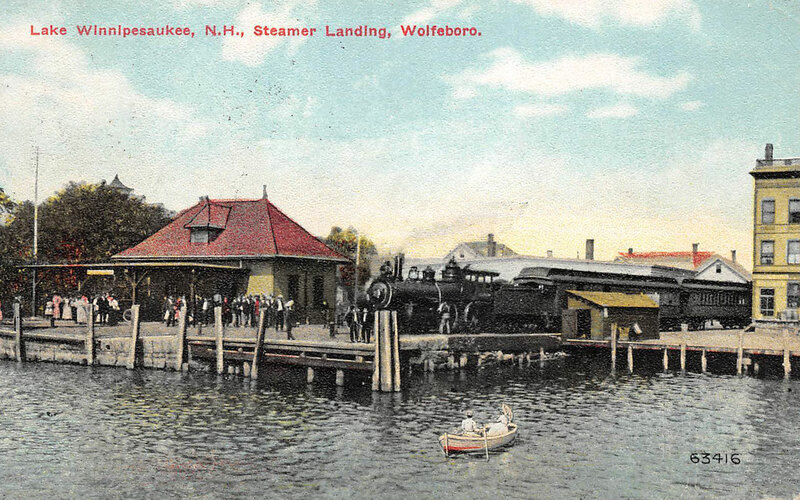 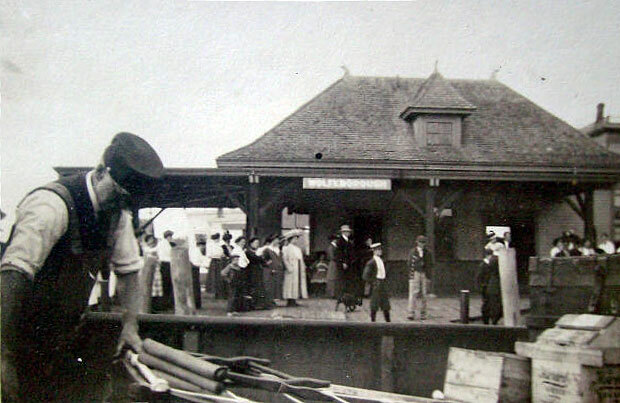 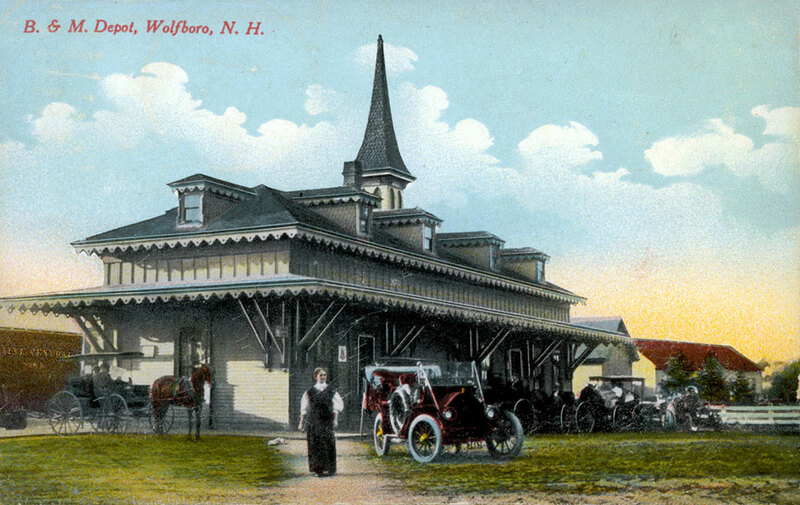 The Wolfeboro Railroad began operations on August 19, 1872. 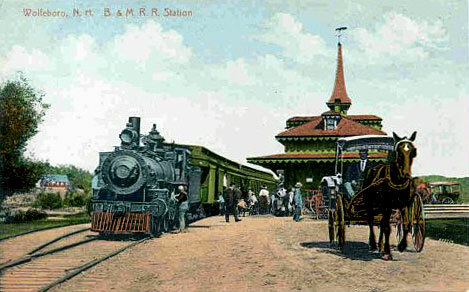 Operations lasted over a century, before finally ending in October of 1985. 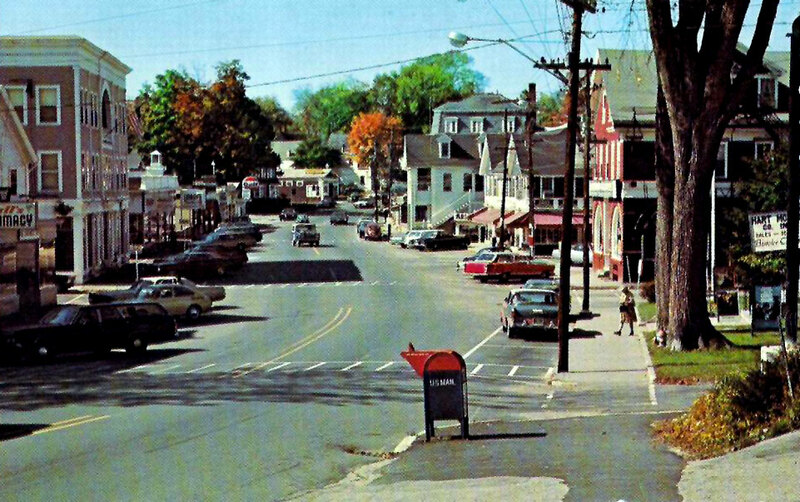 The 12-mile-long line began in Sanbornville, where it branched off from the main B&M railroad line to Conway. 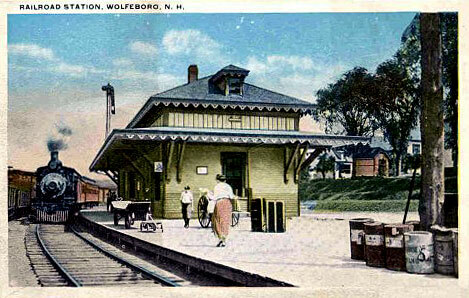 Click here for a gallery of images and here for a history of the Wolfeboro Railroad. 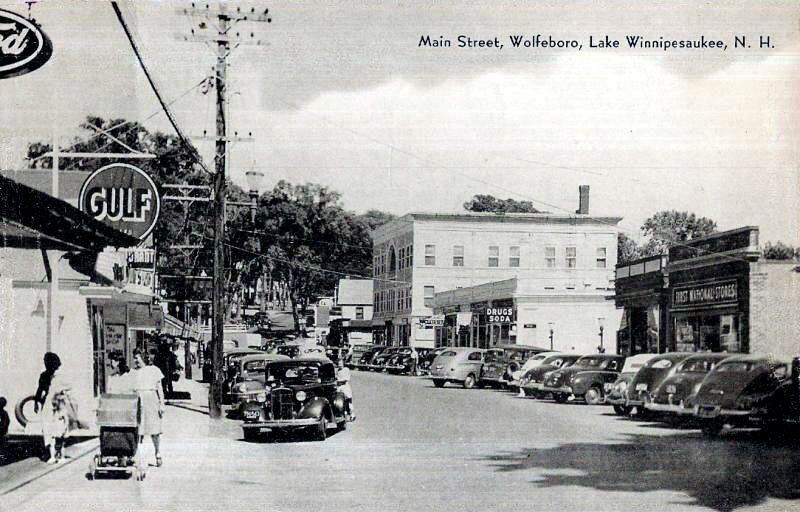 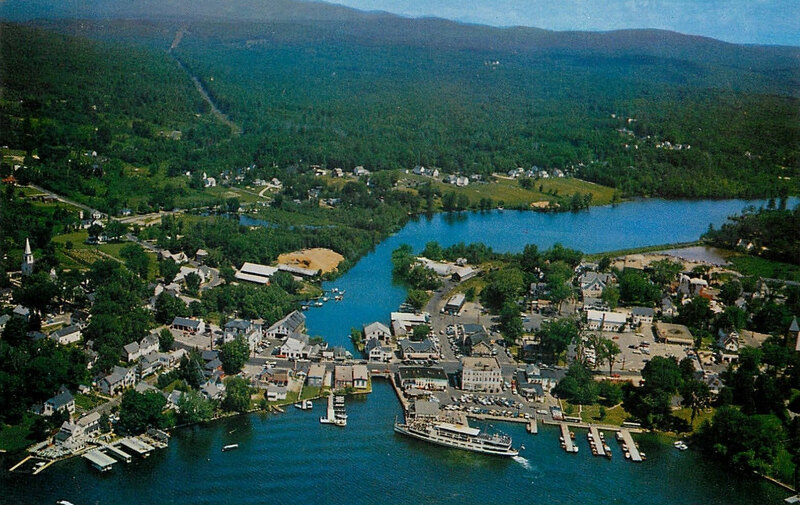 A close-up of downtown Wolfeboro in the late 1930's, showing the old Mount Washington steamer docked at the wharf. 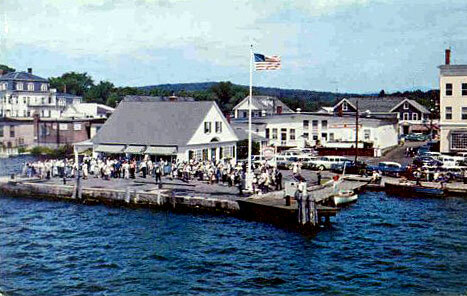 The bridge that separates Lake Winnipesaukee from Wolfeboro's Back Bay, and that also marks the boundary between North Main Street and South Main Street. 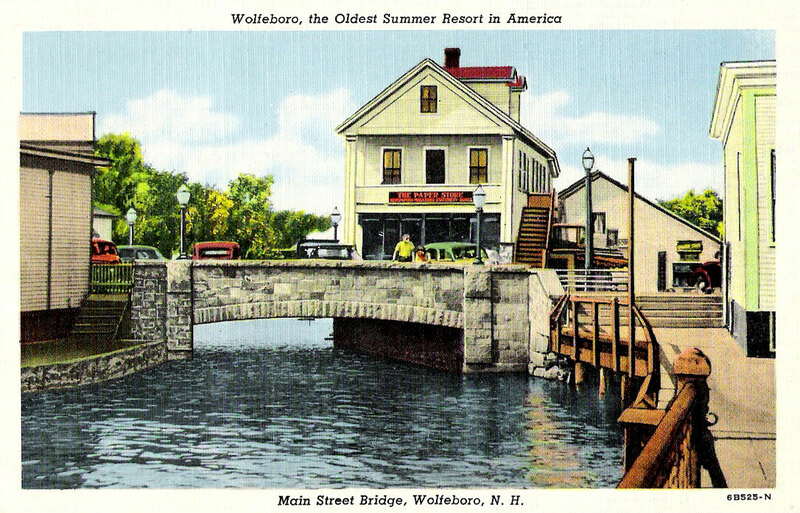 The same view of the Wolfeboro bridge, from two different eras: 1950's above, 1920's, below. 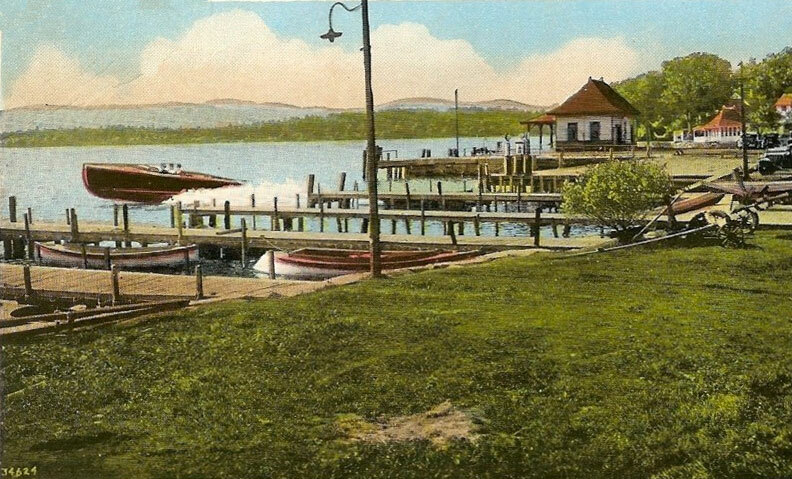 Above and below are two different treatments of the same photo. 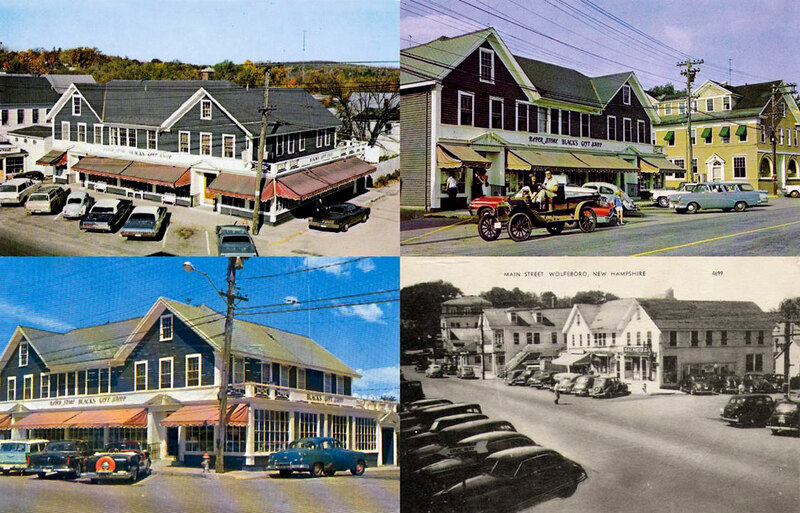 Can you notice all the differences? 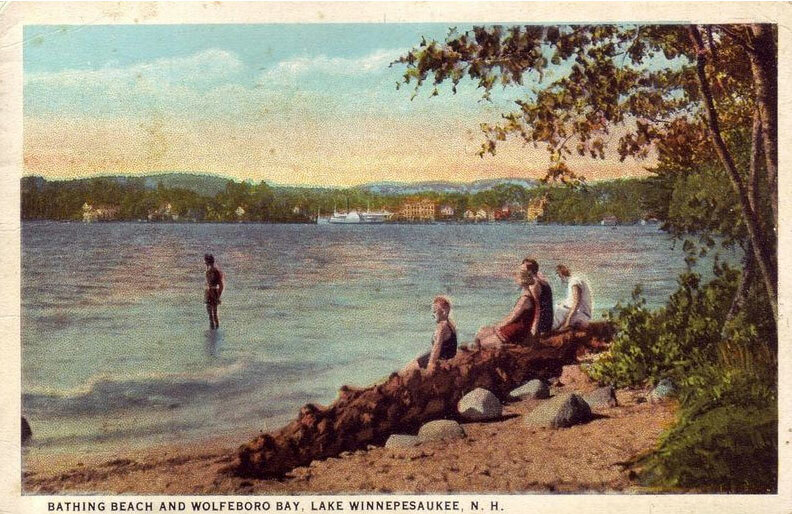 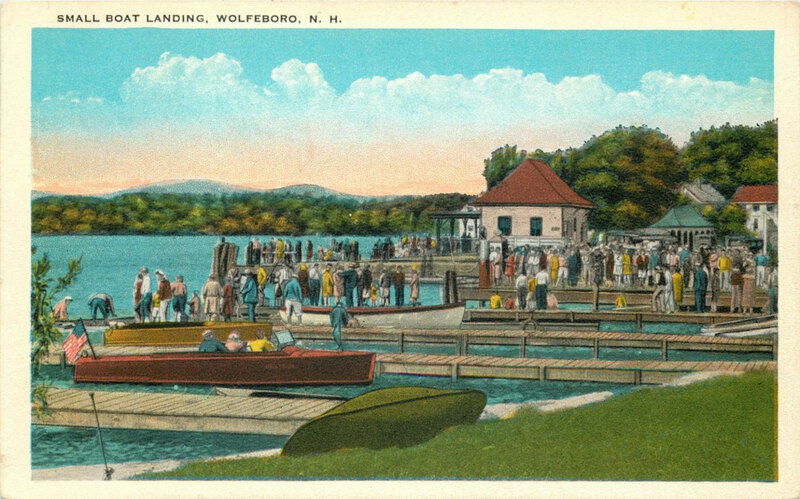 A 1936 postcard showing the landing and a classic wooden boat, followed by a postcard titled "Small Boat Landing"
The Wolfeboro landing, from further out on the lake. 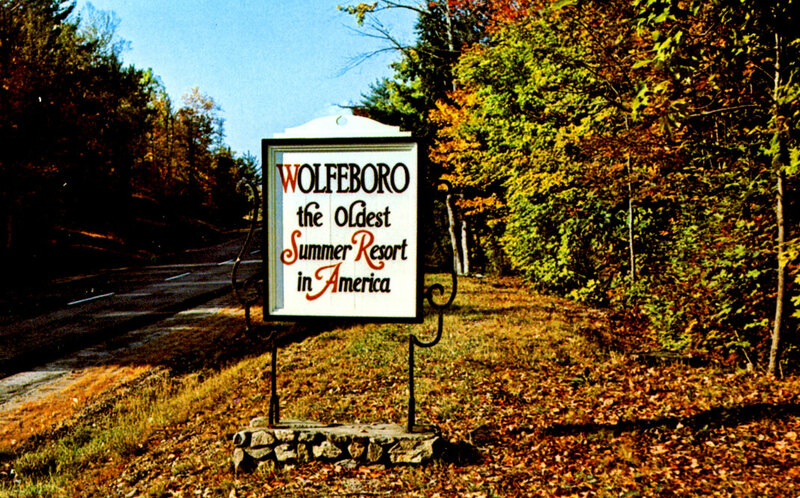 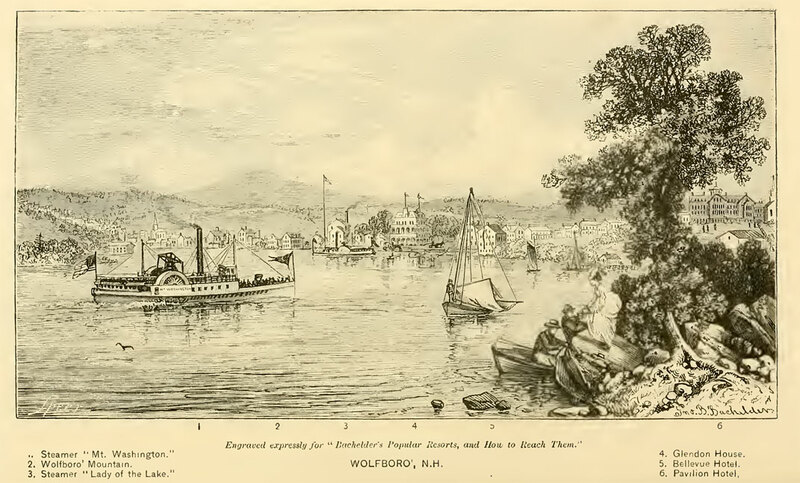 An engraving of the Wolfeboro landing in 1874, from Bachelder's "Popular Resorts and How to Reach Them"
Wolfeboro landing, in the 1950's and 1960's.